Our "Running Display" project allows the 8x8 Dot Matrix Module to produce running messages. The 8x8 Dot Matrix Module from eBay is one of the most popular projects on the web, but you can't do much with it without a lot of instructions for the MAX chip to activate the display. That's what our project does. It drives the MAX chip. Here are photos of the module with leads. The display showing the part number indicates where pin1 is located. Make sure you buy the 8x8 kit with leads. And it is very easy to use when you know the secrets. The 8x8 Matrix (module) has been presented in many projects but none of the them have shown how to interface it to a microcontroller for beginners. That's what this project will do - it will interface it to one of the smallest micros on the market - the PIC12F629 - to produce a "RUNNING SIGN" that you can program with any message. You can also cascade the modules by connecting the output of the first to the input of the second etc. There are over 3,000 videos of projects using the MAX7219 chip and many of them use the 8x8 Display module. You need two lines from a micro to pass data to the 8x8 display. One line (called the clock line) provides the clock pulses and the second line (called the data line) delivers the data. You need two bytes (16 bits) to load each column (one byte contains the data to illuminate the 8 LEDs in the column and the second byte contains other data - that we will explain later). One more line is required to "open up" the chip and this line is called "chip select" or "load." Load means: "Deliver the Information." The chip contains 8 registers and you can access any register at any time via the address bits: D8, D9, D10, D11. To activate all 64 LEDs requires 8 packets of 16-bits. You can access just one column if needed, so updating can be very quick. The "chip select" line must be LOW for the chip to accept data and immediately taken HIGH after the data has been delivered, to lock it into the registers. It is then available for display. You need to send two more packets of information: "noshutdown" to tell the 8x8 to illuminate the display and "Scancols" to tell the 8x8 to scan 8 columns. A routine in the chip then sends the data to the 8x8 as a SCAN ROUTINE and scans the rows 800 times per second. Finally the micro and chip must have the same 0v rail so all voltages (signals) will perform their required task. This takes a total of 5 lines. For the MAX7219, serial data at Din, sent in 16-bit packets, is shifted into the internal 16-bit shift register with each rising edge of CLK regardless of the state of LOAD. For the MAX7221, CS must be low to clock data in or out. The data is then latched into either the digit or control registers on the rising edge of LOAD/CS. (In other words, LOAD must be taken HIGH then LOW to latch the information. LOAD/CS must go high concurrently with or after the 16th rising of each clock edge, but before the next rising clock edge or data will be lost. Data at Din is propagated through the shift register and appears at DOUT 16.5 clock cycles later. (This is used when cascading displays). Data is clocked out on the falling edge of CLK. Data bits are labeled D0–D15 (picture above). D8–D11 contain the register address. D0–D7 contain the data, and D12–D15 are “don’t care” bits. The first received is D15, the most significant bit (MSB). This uses 3 lines from our micro - in other words 3 port lines. Our micro has 5 in/out lines plus one input-only line. We use another input-output line to connect 4 mini switches to create a keyboard and one output with a LED and resistor to test the keypad during set-up. This leaves one input-only line for expansions. The 8x8 Dot Matrix Module does not do anything without a lot of instructions sent to the MAX chip to illuminate the required pixels on the display. That is what our Running Display project does. It sends the commands to the MAX chip. Our project stores the bit-patterns for the alphabet and numbers so a "Running Message" can be produced on the display. You don't need to know anything about the connections of the MAX chip to the display as the module comes with a double-sided printed circuit board, IC socket and pins to accepts the 8x8 Dot Matrix Module. 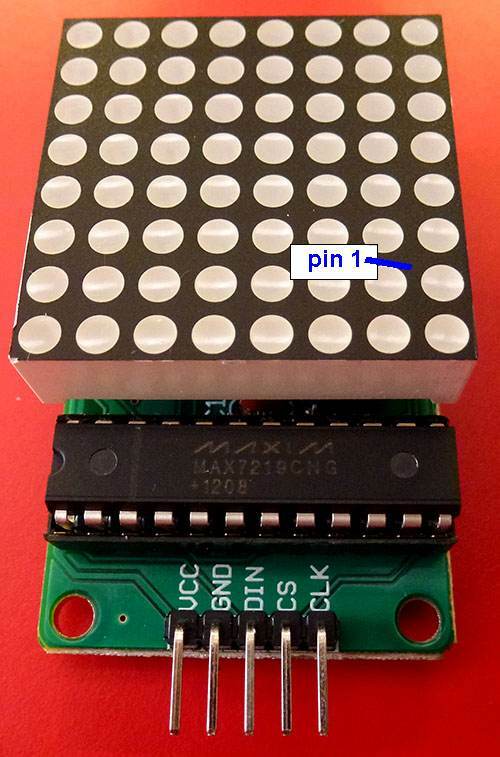 This module is constructed as shown in the photo above but the 5 lower pins are replaced with 5 leads and a socket, so the lines can be connected to our Running Display project. If you have bought the MAX chip and 8x8 Dot Matrix Display separately, all the 8x8 Displays supplied in the kits have the same pin-out, although they have different part numbers. We can assume the 8x8 you have bought will have the same pin-out. There is only one other difference between the 8x8 Dot Matrix modules: The PC boards have 5 input pins: Vcc, Gnd, Din, Chip Select and Clock. However, Chip Select and Clock may be Clock and Chip Select, but this does not cause any problems. The 8x8 Displays are mounted with Pin 1 in the position shown in the photo above and this means the connections to the chip are different to the designated pinout for the MAX7219. All the lines from the chip are connected to the designated places as specified on the pin-out diagram, except segments A to G have been reversed. The decimal point (segment G) remains the same. Buying the 8x8 Dot Matrix Module kit on eBay is cheaper than buying the individual components (less than half the cost) and it makes you wonder why we are charged so much for individual components - especially the MAX chip, where some suppliers want more than $16.00 for the chip! (X-ON Components). 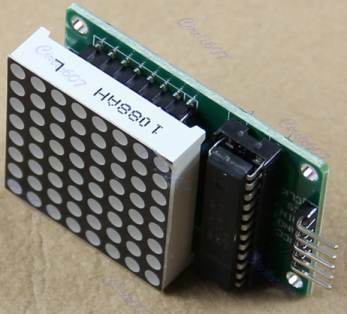 Our project connects to the 8x8 Dot Matrix Module via 5 lines and these need to be connected to our project via a plug so it can be disconnected when programming the chip. Click HERE for the hex values of the bit-patterns above. The "Running Display" project consists of a microcontroller and 4 switches. It contains a program to drive the MAX chip as well as a set of numbers and letters to show on the display. The micro and surrounding circuitry comprise the "Running Display" project to drive the 8x8 Dot Matrix Display Module. These are two different kits and the suppliers are shown on the circuit. RUN produces the final message. It actually sets the number of characters in location 7Fh in EEPROM to zero. The Running Display project is built on Talking Electronics "Designer Board" so you can easily modify the circuit. The board contains the 5 "In-Circuit Programming" pins and the 5-pin socket for the 8x8 Dot Matrix Module. 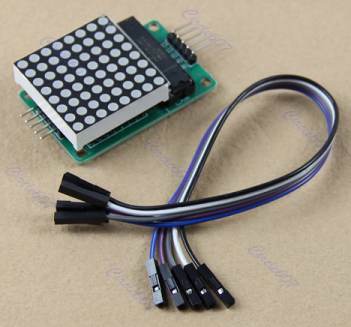 The kit comes with all components and the 5 leads to connect the 8x8 Dot Matrix Module to the Running Display project, but not the indicator-LEDs. The supply must be 6v as the project uses a diode to drop the voltage to the microcontroller to 5.4v. This is the maximum voltage for the micro. The MAX chip and the display are connected to 6v. One of the first things to organise is the detection of the tactile switches. These switches are detected by a circuit called a TIME DELAY, made up of a "resistor and capacitor" in series. When a resistor and capacitor are connected in series, it takes a certain period of time to charge the capacitor (and also discharge it). When the capacitor value is very small and the resistor is large, this time-interval will be very small, but when we are using a microcontroller to detect this interval of time, we can measure in microseconds. You can see the capacitor is connected to a chain of resistors in the circuit above and one line (called a port-line) from the micro is connected to the capacitor. The routine starts by the micro making the port-line an output and creating a HIGH on the line. This charges the capacitor and then the micro turns the line into an input and monitors it to see when the capacitor is discharged. At the moment, the capacitor is connected to the full string of resistors that are not connected to 0v rail and the timing will be long (in the order of many microseconds). The program neglects this reading and classifies it as "no switch pressed." But if a switch (also called a button) is pressed, the time will be reduced and this timing is detected by the sub-routine. The first program we produce to do this is called a TEST PROGRAM or TEST ROUTINE to find out the number of microseconds for each switch. Each group of 6 microseconds will increment a register called "flashes" and this value is used in our program to detect the particular switch. Since the value of the capacitor may have very wide tolerance, our Test Program will generated a value for the capacitor you have used and you must make sure it corresponds with our value. This is especially noticeable for switch 4 with 10 units of "timing." To check the value for the switches, button 1 is pressed BEFORE the circuit is turned ON. The circuit is turned ON and the button is released after 1 second (it odes not matter if the switch is released or not). The LED will flash 10 times for button 1. Repeat this for buttons 2, 3, 4 and 5. The LED will flash 7, 5 and 3 times for the other switches. Make sure the LED flashes the same number of times for the capacitor you have used, so the switches will be detected correctly. If not, button 1 will be detected when button 2 is pressed or button 2 will be detected when button 1 is pressed. The switches are now ready to be detected. After building the 8x8 module (containing the 8x8 display and MAX 7219 chip), you will want to get something on the display. To get something on the screen, you need to produce 3 sub-routines. The first sub-routine loads the address and data to create a column of illuminated LEDs. The top LED has the value 01. The next LED: 02, 04 08 102040 and the bottom LED 80. We have used the value 0AAh for column 7 and this means the 2nd 4th 6th and 8th LED will be illuminated. Don't worry about the other columns. They will be showing JUNK from the other 7 registers as the chip does not clear the registers when it is turned ON. The next sub-routine in Test-2.asm creates to non-shut-down mode. This make sure the display will illuminates the LEDs. The next sub-routine tells the chip to scan all 8 columns. We have added 100mS delays between each of the clock pulses so you can see the chip receiving the data and clock pulses. Three LEDs are added to the PC board on lines Data, Chip Select and Clock to observe the signals entering the chip. This is an important aid to getting the circuit to work correctly, if the display fails to illuminate. As soon as this information is passed to the chip and Chip Select is taken HIGH, the display will scan. In Test-3.asm we remove the 100mS delays and see the display illuminate immediately. Three things we learnt from the "delayed routine:"
1. The chip works at low clock-rate. 2. A small delay must be added between changing bits on the output port. This applies to changing a bit in any PIC register and then wanting to change another bit in the same register. The chip required 300uS between commands for this operation to be reliable (in our routine). 3. The MAX chip must be closed after each sub-routine and opened for the next sub-routine. We can now "drive the display" and the rest of the program can be created to show letters and numbers on the display as well as detect the buttons to Increment the Display (button 1), Decrement the Display (button 2), Store the values (button 3) and "RUN" the message across the display (button 4). Each letter and number uses the 6 middle columns. This means 6 bytes are required from a table. The program puts the first byte of a letter into location 48h and a sub-routine shifts the data from location 48h to 47h. When you push "Run" the display is blank but the shift sub-routine takes the data from 41h and places it is 40h. Then 42h to 41h etc to finally transferring 48h to 747h. This creates the shift on the screen. The program then sends the 8 bytes to the 8x8 Display and calls 200mS delay to show the screen. The program then places the second byte into location 48h and shifts the data to the left. The data is then sent to the display and shown on the screen for 200mS. This continues for the 6 bytes of the letter and then the EEPROM is accessed for the address in table1 for the next letter. When all the letters in the message have been displayed, the program starts from the beginning of EEPROM memory and repeats the message. The hex value for each pixel is shown in the diagram above. These values are needed when you want to create your own images on the display. The table above shows 256 images and the link provides the .hex values for each image. Sometimes a chip will fail to program on the 6th or 10th programming and it will not program on further attempts. The reason is one of the cells inside the chip is preventing the signal being recognised by the programmer. You need to remove the chip from the project so all voltage is removed from the chip to reset the cells, or you can swap the chip for another. Another problem with ICSP is the fact that the chip starts to run the program in its memory as soon as the programmer is connected and if any of the outputs co-inside with the programming lines, you will get a clash that prevents the programmer recognising the chip. The first switch increments the alphabet and numbers. The second switch decrements the letters and numbers. The third switch allows you to store the letter showing on the screen. The fourth switch creates a RUNNING MESSAGE on the 8x8 DISPLAY. To delete the message, press RUN before turning the project ON. Turn the project OFF. The next time it is turned ON, the letter-counter has already been set to zero. When writing a message, the last character must be a "space" to make the message easy to read. When the project is turned off, and turned ON again, the message can be played on the display by pushing "Run." You can add to the message by turning the project off then on again and adding letters. Messages can be as long as 255 letters. The program does not detect when memory is full. You need to keep track. 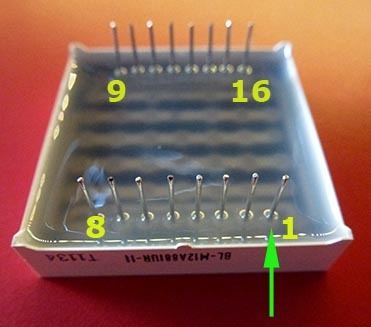 The chip comes pre-programmed when you buy the Running Display kit, however if you want to program your won chip or make modifications to the chip in the kit, you will need to add the In-Circuit Programming pins shown in the photo above. The program is created by adding a few lines of code then testing the result. It is saved with a new name so you can go back to previous developments, if something does not work. Our system of "copy-and-paste" (from other programs and our Library of Subroutines) will help you develop each routine. The library will also answer many of your questions. You will notice we added 3 LEDs to the lines on our development board to observe the clock, data and chip select lines. By adding delays in the program you can see the number of clock pulses to confirm the information is being correctly transferred. This was essential in getting the 8x8 Dot Matrix Module to display the characters as it requires a number of routines to set-up the MAX chip. By using assembly-mode for creating a program, you can see exactly what happens at each stage of testing a new set of instructions and it eliminates a lot of frustration. You don't have to learn any high-level language and you are not left wondering how to write an instruction or what is actually happening. All the assembly instructions are provided in a list with their explanation. Our method is the simplest way to produce a program and is ideal for beginners. There are only about 35 instructions you need to remember to produce a program plus about 100 other instructions to "set-up" various conditions. This is called "HAND CODING" and is suitable for a program up to about 1,000 instructions. The 8x8 Module program is just over 350 instructions long, with a 250 byte table, so you can see how much can be contained in this very small microcontroller. A completely new set of characters can be shown on the display and this program can be access by pressing switch A before turning on the project. This will access the new program and you have just over 400 locations available for sub-routines and a table. You can add 6 more characters to the table to be within the 256 byte boundary or produce a completely new table. Even though this will give you less than 150 bytes for programming, you can achieve a lot of effects because you will be able to CALL already-prepared sub-routines. 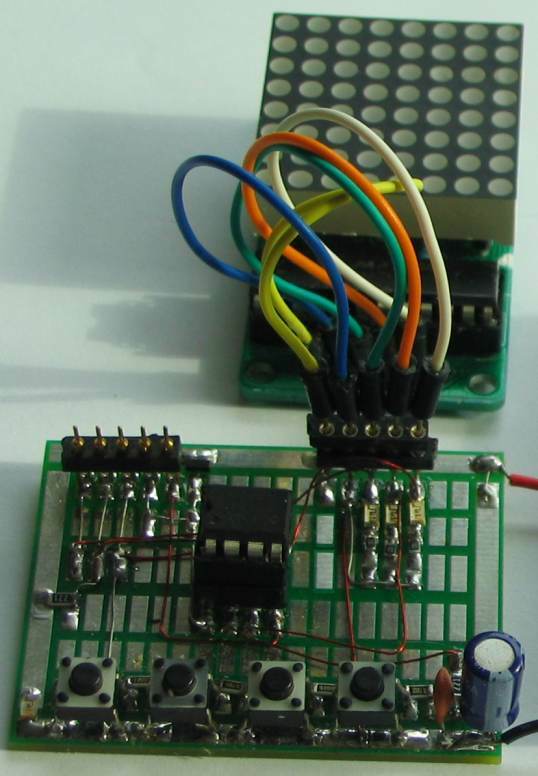 This project shows you how to connect a number of switches to a single port-line, how to drive a MAX chip, how to create running messages on the 8x8 dot matrix display and how to store data in the EEPROM. All these are valuable "building-blocks" for the time when you want to design your own project. Do not put the following program into Notebook 2. Use the .asm file above. The following program may have formatting problems and it may not compile properly. Compiling is done with MPASM to produce .hex file (as well as other helpful files). btfss   temp3,0  ;these 3 instructions are very clever!!!! btfss   address,0  ;these 3 instructions are very clever!!!! movf    current,w	;end of message? call    Shift       ;create "running effect"
btfss   temp4,0  ;these 3 instructions are very clever!!!! bcf 	TRISIO,5	;clear bit GPIO,5 as output to charge cap. bsf	gpio,5		;make pin2 HIGH to charge cap. The next thing you can do with the 8x8 is cascade the modules to make it easier to read the running message. We have developed a program to run 3 modules, however it will run 1,2 or 3 modules without any modification.